Comparing the infiltration rate of street trees with and without guards in Manhattan's Morningside Heights neighborhood, the researchers found that trees in protected pits absorbed water six times faster on average than tree pits without guards—3 millimeters versus .5 millimeters per minute. The researchers hypothesize that the guards improve infiltration by limiting soil compaction in tree pits. "Placing guards around tree pits allows urban trees to absorb more storm water runoff, taking pressure off the city sewer system," said the study's senior author, Patricia Culligan, a professor at Columbia Engineering and a member of Columbia's Earth Institute and Data Science Institute. The researchers were surprised at what a difference the guards made, and how little mulch or additional vegetation improved results. City-recommended tree guards cost about $1,000, depending on their style and size of the tree pit, but an improvised $20 fence can work just as well, said the study's lead author Robert Elliott, a recent graduate of Columbia Engineering and cofounder of Urban Leaf, a New York City startup helping city dwellers grow food at home. "Only 14 percent of New York City trees have protective guards," he said. "Our results suggest street trees could manage six times as much storm water if every tree pit were enclosed," he said. New York's 660,000 trees cover about 6 percent of the city. Besides cleaning and cooling the air, trees benefit the city by soaking up rainwater that runs off its impervious roads and buildings. During heavy storms, the aging network of sewers is unable to keep up with the combined flow of wastewater from streets and homes. As a result, heavy flows are often released directly into nearby rivers, raw sewage and all. To reduce these combined sewer overflows the city has turned to 'green infrastructure,' or engineering solutions that harness trees and other vegetation to drain the built landscape. The push has spurred a related effort to measure the cost-effectiveness of each solution. In a related unpublished study, Elliott and his colleagues compared the relative costs and benefits of guarded tree pits to bioswales, which are pits dug into city sidewalks and planted with shrubs to serve as catch basins. They found that bioswales substantially outperformed guarded tree-pits when factoring in their initial cost plus maintenance over 10 years; Bioswales captured 141,886 gallons of water per year, at 20 cents per gallon, compared to a guarded tree pit's extra 1,132 gallons per year, at 49 cents per gallon. But trees become more competitive, says Elliott, if the cost of guards is reduced or water flows are increased by digging out the tree pit's curb so water from the street can flow in (much like a bioswale. Trees also tend to attract less controversy, he points out. 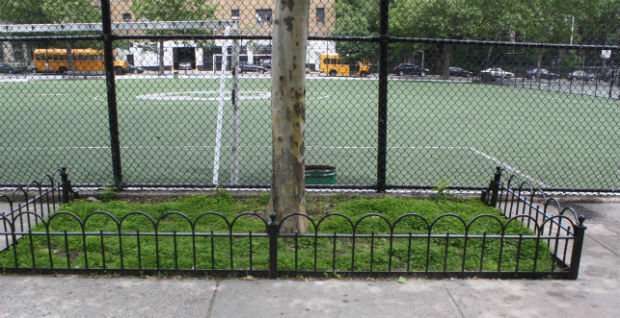 Residents have complained that some of the 3,000 bioswales New York City has installed in the last five years in Brooklyn, Queens and the Bronx are ugly.